Since his moral victory in forcing the government to form a joint panel for drafting the long pending Lokpal Bill, Anna Hazare has been facing sniper attacks from politicians of all hues. Kapil Sibal took a pot shot at him for his obsession with the Lokpal bill claiming that the people’s problems were different and that the bill had no significance for the illiterate and thirsty. This was a specious argument, considering the fact that the poor and the illiterate are most affected by corruption because it denies them the their much needed entitlements. Digvijay Singh then suggested that Anna Hazare should fight elections. This was a subtle reminder that the influence veiled by him was extra constitutional and that the government may not be willing to oblige him all the time. His reference to elections is consistent with the thinking of the political class that considers electoral victory (by fare or foul means) to be the touch stone of all power in a Democracy and attaches no significance to morality. Pranab Mukeherjee dubbed the joint panel as a ‘new experiment‘, the success or failure of which will determine its outcome, hinting government unease and a possible future snub. L.K. Advani in a veiled attack, criticized persons close to Anna Hazare for demonizing politicians. There was even a tame protest by various political parties against the overt attempt of agitating Civil Society activists to distance themselves from all political parties by refusing entry to them. To top it all, an anonymous CD surfaced just days before the first meeting of the joint panel, accusing the Civil society co-chair,Shanti Bhushan of trying to negotiate to fix a judge. Another bomb shell was dropped by the Karnataka Lokayukta Justice Santosh Hegde, who is also a civil society representative on the panel, by his statement that he was considering to resign from the panel in view of the ongoing slander campaign against them. All of the above may seem like disparate and disjointed criticism, but their real target is the Lokpal Bill itself. Politicians fear that the presence of civil society members will throw up a draft that will be politically very costly to oppose. This is why they are desperately trying to nibble away the credibility of the civil society members to turn the panel into a nonstarter . 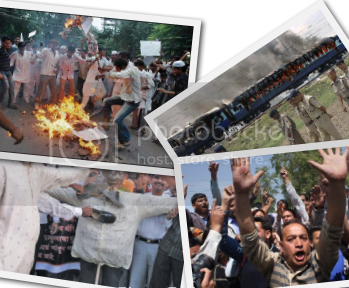 They were all together in condemning Anna Hazare for his denigrating of the politicians. This despite the fact that everyone agrees that the movement would have fallen flat on its face, had it been perceived to be obligated to any political party. This predicament of politicians where it is hard even to argue that there are good as well as bad politicians, is what worries the top political leaders most. Yet the decline has not been sudden. Things have grown from bad to worse. For years civil society activists have waged a loosing battle for reforms. Thinks have failed to take off wherever interests of the ruling elite have converged. Political leadership have also failed miserably in isolating the bad apples amongst them. For too long the law makers have reveled in being the chief law breakers. Even though in the past too there have been many fasts unto death inspired by Mahatma Gandhi, most have faced public apathy, some were dubbed as maverick acts, some were even made fun of. 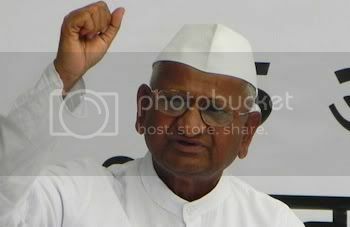 Very few have received the wide spread public support that Anna Hazare got. His honesty and simplicity though were only part of the reason. The other important reason was the in rising public anger against rampant corruption and the recently unleashed season of corruption that never ends. Even though there is no denying the danger of a sustained denigration of politicians in general, corrective measures are needed to restore the balance of public concern in governance. Only massive public support can ensure that the involvement of civil society does not remain an isolated experiment but leads to more responsive governance that acts instead of stalling crucial reform legislations such as Women’s reservation, Election reform, Police reform, Witness protection act etc. apart from the Lokpal Bill and the anti corruption measures. Recently while campaigning for Bihar Elections, Sharad Yadav made a controversial remark about ‘throwing Rahul Gandhi’ into the Ganges. While his remark may simply have been a ruse to draw attention, there does exist a valid case for dumping all the current Maharashtra politicians into the Arabian sea. Vilasrao Deshmukh(Congress): CM from 1999-2003, was replaced by Sushil Kumar Sihinde in January 2003 –> Again become CM after 2004 elections replacing Shinde –> had to resign after 26/11 attacks in 2008, was replaced by Ashok Chavan –> rehabilitated into Union Cabinet in May 2009 as Minister for Heavy Industries. Sushil Kumar Shinde(Congress): CM briefly between January 2003 – November 2004, replacing Vilasrao Deshmukh –> Won the elections but was replaced by Vilasrao Deshmukh again, and was packed up as Governor of Andhra Pradesh –> inducted into Union Cabinet as Minster for Power in 2006. Towering above everyone else there is Sharad Pawar, who formed NCP in June 1999 after quitting Congress over Sonia Gandhi’s foreigner status, yet had no qualms aligning with Congress in the state (1999 onwards) and at the centre (2004 onwards) for power sharing. Besides being the overworked Union Minister for Agriculture and PDS, he still finds time to be the czar of the multi-billion Cricket Industry and the NCP President. He has diverse business interests, majority of which are undisclosed. Closely linked to him is Praful Patel, a businessman turned politician who is currently the Minister of state for Civil Aviation in the Union Cabinet. To give him company there is another businessman turned politician of the Congress party, Murli Deora, who is the Union Cabinet Minister for Petroleum and Natural gas since 2006. None of them however can overshadow Suresh Kalmadi who outshone everyone in the just concluded Common Wealth Games. The opposition ranks are equally discredited and insipid. The principal opposition party, Shiv Sena formed on narrow, regional parochialism and Hindu right wing ideology is on the decline due to an overage patriarch and the third term out of power. Its writ though still runs large among Businessmen and Film fraternity, whom they armtwist with the threat of violence. Matching them step for step and exceeding in venality is its new off shoot MNS. This new breed of politicians is even more brazen and intolerant. The BJP has long been reduced to being an appendage of the Shiv Sena and is incapable of independent action. 1. All major political parties are controlled by ‘remote control’. In case of Congress it is true nationally, yet the vagaries of changes in Maharashtra have surpassed their own standards. For NCP, the keys to power are securely kept with Sharad Pawar and his confidante Praful Patel.They may be Union Ministers but their heart still lies in Maharashtra. Balasaheb Thakrey of Shiv Sena has always prided himself for being above the fray. In his hey days, he nominated Manohar Joshi to be the Chief Minister only to be replace him with Narayan Rane towards the fag end of his term. BJP’s remote control used to be with Pramod Mahajan till he was alive, after that it has lost relevance. The politics of extra constitutional authority has often brought in power without accountability leading to more rapid degeneration. 2. 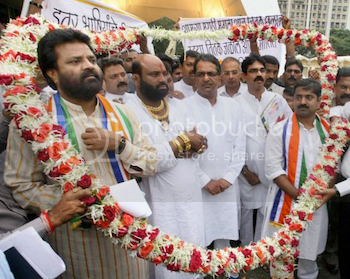 Another salient characteristic of Maharashtra politicians is their close association with business community. Mumbai being the business capital of India, most politicians have overt business interests in Sugar, Real Estate, Education or Hospitality besides covert involvement in crime syndicates or illicit businesses. This has created strong vested interests and fueled Corruption at all levels. 3.Whenever someone gets discredited in the public eye or is named in a scam, he is shunted out for a brief period of time, only to return back either in the state or the centre, after the public gaze shifts on to some one else. There is little hope for Maharashtra with the current batch of politicians. @Chetan_Bhagat has a point when he suggests that may be its time for Rahul Gandhi to try his hand at being the interim Maharashtra CM before he ascends the throne at Delhi. 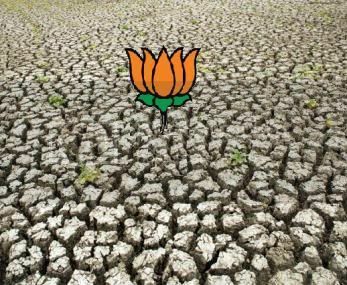 Three months back Pritish Nandy wrote a hard hitting article ” The irrelevance of BJP” lamenting on its state of affairs with a view to bring it out of its stupor. On the other hand Rajesh Jain, India’s numero uno digital entrepreneur and also a leading light of the ‘Friends of BJP’ has long maintained that it would be too much for us to expect the rise of another National Party in our lifetime, so we are stuck with the choice between the two mainstream political parties – Congress and BJP. Both got me thinking on what would it take to revive BJP. BJP after all is not just a Hindu nationalist party of right leaning individuals. Its our only hope for creating a bipolar polity in out country. It is almost 30 years old (if we disregard its previous avatar of ‘Janasangh’), yet it has just managed to cross the Vindhyas to form a government in Karnataka. There are still many regions and states where it does not have a presence and several others where it had a dominant position earlier, but is now in decline. Hoping another new, emergent party to match the national presence of Congress might be nothing short of asking for a miracle. That BJP is in shambles, there is no doubt. Loosing two elections in a row seem to have brought it down to its knees and exposed all the chinks in its armour. From being a party of youthful leaders most of its youthful leaders have shown themselves to be made of clay. They specialise in bringing down each other while giving a walkover to the ruling party. It has miserably failed to be an effective opposition even though they have been handed price rise as an issue on the platter. Its time, BJP rethinks its vision as a party right of centre that aspires to dominate Indian Politics as one of the two major national parties. While its roots and ascendancy did lie in being a pro-Hindu, anti-Muslim party, going further it may need to do a rethink. In a country where a large majority (almost 90%) of politicians are all hindus, being pro-Hindu does not count for much. Whatever boost it got from the Ayodhya issue can hardly ever be replicated again,as people tend to quickly return to their normal state after the aberrations of agitations like L. K. Advani’s Rath Yatra subside. As for being anti-Muslim, they needs to do a dispassionate analysis of the baggage that it brings and its advantages, if any. It may have helped them consolidate their position in Gujarat to successfully ward off the challenge from Congress in successive elections. But while they won the battle in Gujarat, they lost the war of India. From Trinamool Congress to Biju Janata Dal, they lost critical allies as a result of their stance on Gujarat issue. Even now, this issue remains the sore point with their only remaining major ally, Janata Dal United (JDU) in Bihar. Its longest standing pro-Hindu ally, Shiv Sena on the other hand is turning more and more into a liability rather than an asset. In the process, BJP has failed even to become the epicenter of the non-Congress, non-left opposition. The biggest worry for BJP should be that even in opposition, anti-BJP-ism is a bigger draw than anti-Congress-ism. For those who think that Gujarat can be replicated in India, they need to draw lessons from the Communist plight in West Bengal. Indoctrination such as Gujarat or West Bengal, only has a limited shelf life and can never be replicated nationally. Every party can have a set of moderates and hawks, however its important to reign in the hawks or they will eat up the party itself. In its desperation to play the Hindu card BJP might have failed to notice another virtue within its fold – its track of ‘Good Governance’ . Most BJP governments have provided clean and efficient governance. Even in states where its government was ousted due to defections such as Goa and Jharkhand, its earlier performance is remembered fondly. So too in coalition governments, the BJP ministers normally come out in flying colours. It was also the first one to use BSP – Bijlee, Sadak, Panee (Electricity, Road, Water), issues of everyday concern to win elections in M.P.. Its Golden Quadrilateral road project is still acknowledged as one of the most ambitious infrastructure project of modern India. Its decisive nuclear action has had far reaching implications stretching long beyond their reign. It needs to draw upon all these experiences and consolidate them to appeal to an electorate that is tired of mere identity politics and is looking for real solutions to real problems. While its earlier claim of ‘a party with a difference’ may have withered off, it should now re-brand itself as the party with governance. The coming elections in Bihar where its ally Nitish Kumar is attempting to put governance as the central issue, may turn out to be a test case for the entire country whether governance can take on the more emotive issues. If he succeeds, he might become a trend setter. Therein might lie a ray of hope for BJP too. Strikes are still the weapon of choice for political parties to drive home their point. Yet a look under the hood of a typical strike, fails to reveal anything distinctive or hope inspiring. The strike date is notified well in advance (so much for spontaneity). It is then publicised through all means available. Media picks up the announcement and features it prominently, giving it further publicity. At local levels threats and innuendos are used freely to forewarn everyone. On the day of the strike, hooligans and muscle power is used to force shops & offices to close down. Many though stay away on their own, fearing violence and commotion. Trains and other modes of transportation are obstructed, with least concern for those caught in the middle. Many a times those in urgent need of hospitalisation are unable to get their, those traveling for work, interview or examination are also made to suffer for no fault of theirs. The more the hardship to the public, the more successful the strike is considered to be. At the end of every strike, supporters always claim that the strike was spontaneous, voluntary & a grand success while the opponents claim it to be a flop show. No quarters gained, none lost. Net result is loss to the public exchequer and public misery. Apart from general strikes that are ignited by occasional events, there are the ‘habitual’ strikers. Every year at the start of festive season the municipal workers strike work, the teachers & the non teaching staff go on strike during the admission season, Doctors strike work even when the ICUs are full of critical patients, bankers go on strike just before a long weekend. The intent clearly is to maximise the impact. The apparent success of the strike is again measured by the amount of public hardship. While it is natural for us to blame the strikers for all the public hardship, the Government is equally to blame. One could understand if occasionally there was an issue that was complicated and could not be solved solved easily, leading to agitation. But strikes have become an integral part of our lives. So much so that first one agitates for constituting pay commission, then agitate if recommendations are not to one’s liking, then on to enforcing its implementation. Once the central Government implements the recommendations, as if on cue, one by one the state Government employees start seeking parity with central employees. On and on the cycle keeps repeating itself. Worst part of the process is that Government frequently goes back on the settlement reached at the end of a strike. There are strikes and agitations to simply get Government to keep its word and sometimes for payment of salary for the previous strike duration. 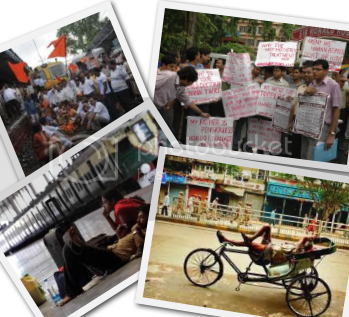 The frequent agitations are symptoms of a deep malaise in our system. They show that our grievance redressal mechanisms have all collapsed. While the judiciary takes ages to resolve complaints, everyone else is too busy protecting their own vested interests to spare time for problem resolution. Take for example the 3 – 4 PM slot that is normally reserved by bureaucrats to meet public for grievance resolution. Most officials make it a point to be away from office during the time period. Even meeting a public official does not lead to a solution. Things have come to such a pass that even problems referred by the Chief Minister in his Janata Durbar need multiple petitions before they get redressed by the officials down below. Even the courts have to get their judgments implemented by using the ‘contempt’ stick. Officials use every ruse for not implementing decisions that are not to their liking starting with appeals to simply delaying their implementation . Every organ of the state needs to be dragged by the scruff of their neck into doing anything. Often Government becomes the biggest law breaker when it tries to brow beat individuals and smaller groups with its size and power. All this leads to a general environment of non compliance and encourages people to agitate for their just as well as unjust demands . Things can only improve if problems are redressed at appropriate levels and judicial intervention is available in a defined time interval.